1. Link back to the person who gave you this award. Check out Donah's blog http://mnemonicreveries.blogspot.com/ - I totally dig the title too. 3. 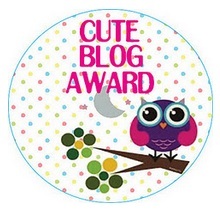 Award as many blogs you think deserve this award. 4. Make sure you let those you give this award know that you awarded them. 5. Tell something you have never told before in your blog. 1. What is your go to make up product? Anything MAC but if I have to pick one - it's the shimmer. It always makes my makeup look flawless. 2. What's your favourite fashion trend of 2011? I am not sure if this was a trend but I really dug boot season. There were so many interesting styles and ways to wear boots. A Pizookie from BJ's - Half chocolate chip and half white chocolate cookie fresh from the oven with a scoop of vanilla ice cream. Delish! Bluegreen - the color of the ocean. The color of my mind. Martice - named after my biological father who did not raise me. I like that if you take the first 4 letters and combine them with the first letter of my first name, it spells "Smart". This is something I used to tell my mother when I was little. "Mommy, I wanna be 'mart". Hate cats (Sorry to all you cat lovers). Love dogs. Allergic to cats. Love kittens. I do silly dances and make funny faces whether people are there or NOT. Congratulations on the award, you sure are cute :) and so is your blog. Thank you kindly for thinking about me, I shall definitely pass it on in a few days. Txs again and congrats :). Dr. Suess said, "Those you mind don't matter, and those who matter don't mind." What a smart guy. Congrats on the cute award! Found your blog because of the links from Donah's blog. :) Glad she did pass it on you Sha. After visiting your blog, I could not leave without putting a comment. I congratulate you on your blog! Maybe I had the opportunity to welcome you on mine too! and if you would like to know your blog!